Hearty Creamy Mushroom Soup – A Dairy-free Recipe! 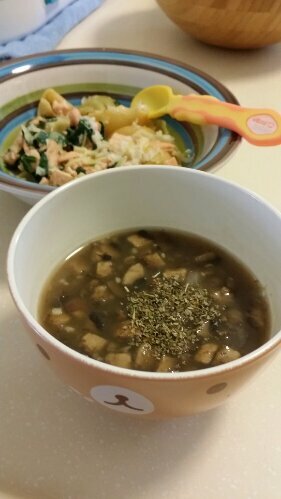 2 Comments on Hearty Creamy Mushroom Soup – A Dairy-free Recipe! Mushrooms are one of our fave ingredients, and nothing beats a soul-soothing bowl of creamy mushroom soup, except minus the calories and not so healthy bits of cream. These fungi boast a wealth of nutritional goodness such as Vitamin B, which is essential for healthy digestive and immune system, Vitamin D needed for the regulation of calcium and phosphorus absorption, maintenance of healthy bones and teeth and minerals such as Selenium that works as antioxidants to protect our bodies from damages which might lead to heart diseases and cancers. 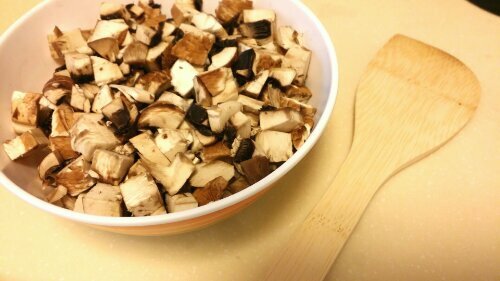 2 big Portobello mushrooms – rinsed and chopped to desired size. A blender is helpful but not compulsory unless super fine bits are preferred. We like the chewy parts, so chopping was great! 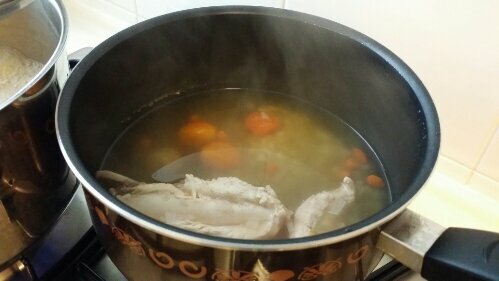 Soup stock – we did chicken and veggie stock but you can use packaged stock or cubes too. 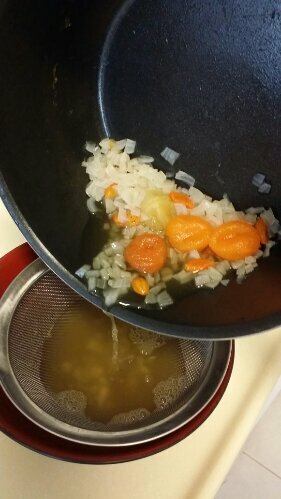 First, we’ll start with making the soup stock. Tomatoes – chopped large ones. We used cherry tomatoes here. 1) Place all ingredients in pot of water and let it boil. Simmer over 30 minutes in low fire. 2) Strain ingredients and set soup stock aside. As for ingredients, you may wish to use them to cook another dish, if preferred. 1) Saute garlic lightly over heated pan. Add chopped mushrooms and stir fry them. They will visibly shrink, and turn darker. 2) Turn off fire and remove them from pan. 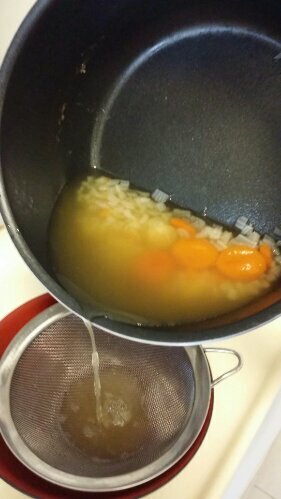 Pour into pot of soup stock and allow to boil under medium heat for 15 minutes, or till soup turns brown. 3) Add flour into soup and stir to dissolve. Flour thickens soup, so if a thicker consistency is preferred, add more flour. Allow to boil for another 10 minutes, turn off fire and prepare to serve. – Mushrooms can be replaced with white button, shitake or swiss brown instead or even a mix. Hope your family enjoys this yummy slurpy goodness! Did you like this recipe? Share with us your thoughts and follow us on Instagram and Facebook to see what else we are up to!